Pamela and Glen Gunsalus are always easy to find – happily working in their vineyard, lovingly tending it like a treasured garden plot virtually every day of the growing season. After retiring from long careers in medical research, they moved to Northern California and purchased property near the adorable, tiny town of Graton. Gunsalus vineyard, 10 acres of Pinot Noir, was planted in 2001 with a variety of Dijon clones. 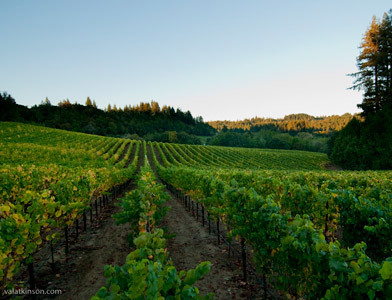 It is located on a northwest-facing slope in the Green Valley of the Russian River Valley Appellation. This meticulously cared-for vineyard sits on well-drained Sebastopol loam and Goldridge sandy loam soils. Wines from this vineyard typically exhibit a beautiful garnet color and a lovely bouquet of ripe red fruit and floral aromas. Soft, silky, unctuous and alluring, these wines are gentle, graceful and extremely enjoyable. The first vintage of Talisman Gunsalus Vineyard Pinot Noir is 2007. Check the current weather conditions at the vineyard from the Gunsalus' weather station!